Angel Cheeks is an explosion of pink. Chances are you’ll never forget this peony once you have seen it blossom. In 2005 the prestigious American Peony Society awarded the gold medal to this lovely peony. Because the size of its flower, the look of it's buds and most importantly its vase life she was judged best peony of the year. Maybe she will become your favorite peony to! Angel Cheeks transforms from a medium-sized flower bud into a huge pink ball with a golden center. Because of her wonderfully fresh scent she really excites all the senses. 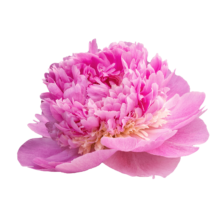 The peony was bred in 1975 by Carl G. Klehm, one of the most renowned peony breeders in the world. He is known for beloved peonies such as Pillow Talk, Bowl of Cream and Dinner Plate. Paeonia Angel Cheeks opens up explosively. The peony is ready to be cut when you can wipe away the green bracts with your thumb and the inside of the bud is showing colour. The flowers can quadruple in size, so give Angel Cheeks enough space in a vase or in a bouquet to unfold it’s full potential.